Models are available for a range of applications from commercial food service to light industrial and institutional. Refer to the literature page for complete information on each model. 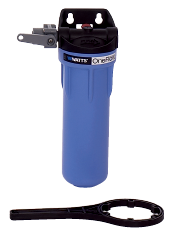 Cartridge based system designed to be installed on the water line supply to devices such as water heaters or hot-beverage appliances that require scale prevention. 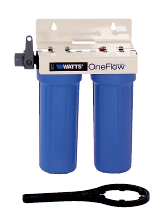 This dual cartridge system is perfect for food service applications. Install on a cold water line prior to a device such as a coffee maker, espresso machine, post-mix system or other appliance to remove chlorine taste and reduce scale formation. Install on the supply line to storage type or tankless water heaters to reduce formation of scale on the heating elements. This helps to keep the heater working efficiently, reducing the cost of operation. Flexible option for point-of-entry or point-of-use installation. Models are available for systems from 10 to 75 GPM. Tanks can be plumbed in parallel for achieving flow rates up to 1000 GPM.